Across the board, the largest complaints about software vendors and their business practices have come from increasingly aggressive software auditing practices. Once thought to be a small possibility, the software vendors now wield this big stick to drive up sales and of course ensure compliance. Given the 32 percentage gain since Q1 2008 in the percentage of respondents faced with a software audits, procurement managers, CIOs, and CEOs have paid attention (see Figure 1). Even the recent Gartner report from star analyst Jane Disbrow et al. 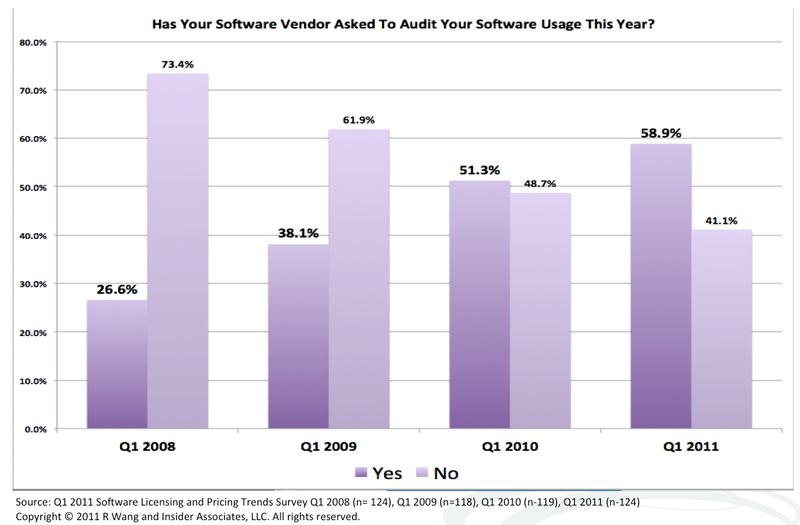 shows that 61% of their customers have been audited by at least one software vendor. After speaking with 13 major software vendors, most admitted that software audit served two purposes. The first – keep customers in compliance. The second – shaking the bushes for new deals during the recession. Keep good records and centralize contracts. Put all our contracts in one place. Keep historical records. Track changes in contract language. Don’t forget to include merged and acquired entities. Deploy software license management tools to proactively monitor usage. Track your license usage and shelfware. Use software license management tolls to automate the process. Advanced users can provision, deploy, manage, and retire licenses with automated tools. Include auditing rights provisions in contracts. Secure written notification of an audit at least 60 days in advance. Ask for a project plan and timeline that lists what the audit activities will include. Seek a list of products to be audited. Agree on a noncompliance resolution process. Keep the process nonpunitive for noncompliance between 5 to 10% of total licenses. Avoid the upsell and aggressive software sales tactics. As for the right to choose an independent third party to conduct the audit. Customers should have freedom from sales threats of audits as a negotiation tool. Guarantee protection from future audits for at least 24 months if noncompliance remains less than 5 to 15%. Experiencing an upgrade? How has the experience been? Was your vendor cordial? Was it a sales shakedown or was it sincere? Add your comments to the blog or reach me via email: R (at) ConstellationRG (dot) com or R (at) SoftwareInsider (dot) com. Buyers, do you need help with your apps strategy and vendor management strategy? Trying to figure out how to infuse innovation into your tech strategy? Ready to put the expertise of over 1100 software contract negotiations to work? Give us a call! This is where the practicality of 3rd party IT management software / tools come in handy. Not complying to vendor software auditing is both painful and costly. Remember one incident back in 2008? It involved Dynamic Systems Inc. (the user) and Autodesk Inc. (the vendor). The former company was fined approximately $100,000 by the latter because the software auditing system found out that Dynamic Systems is running unlicensed Autocad-based programs. And it was again penalized for $10,000 for its illegal use of Microsoft Exchange. Dynamic Systems is not alone. Others include Take Bickel Underwood Corp (fined with $73,300) and Payless ShoeSource ($124,000). My point is, 3rd party IT management software / tools are not only process-efficient, it’s also practical. It can help you run your business more effectively without the hassle and bustle of IT compliance.